With wu zhu yu fruit extract! 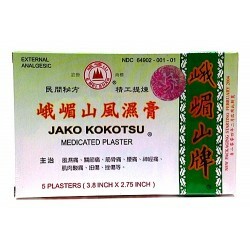 Use for fast deep penetrating relief of most muscular and joint aches and pains. Directions for Use: Apply to well cleaned afflicted area. Ingredients: Menthol, camphor, methyl salicylate, wu zhu yu fruit extract. Made by E Mei Shan, China. Contents: Five plasters per pack, each 3.8”w X 2.75”h.